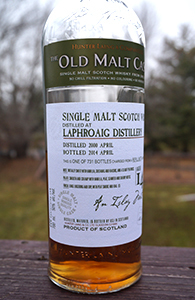 I purchased this Laphroaig in knee-jerk mode. Laphroaig is my favourite distillery; sherried Laphroaigs are thin on the ground; the marriage of peat and sherry is great when it works out; almost every sherried Laphroaig I’ve had has been very good. So this seemed like as sure a bet as I was ever going to make. I opened this bottle for one of local group’s tastings earlier in the fall and it did not do so well. One person did like it a lot but almost everyone else had it as their bottom whisky of the night (we drink an ounce each of four whiskies at each tasting and everyone other than me drinks blind). It wasn’t my bottom whisky but I didn’t give it a high score either. The problem? Sulphur. Now, it’s been my experience that sulphur can sometimes dissipate and so I let the bottle sit for a long time before coming back to taste it again. I could tell that there was a very nice whisky under there somewhere and I hoped time and air would pull it out. Did it happen? I’m sorry to kill the suspense, but no, it did not. There was some improvement but it remained a sulphured mess.